The Democrats’ internal fight over the anti-Semitism resolution reveals a stark picture of the competing factions vying for control over the party’s agenda. 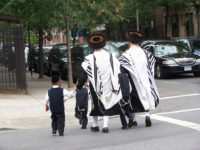 While the nation was focused on a hoaxed hate crime, Brooklyn’s Jews have been repeatedly and actually attacked. Are we not discussing it because most of the perpetrators are black? Supporting Nation of Islam’s Louis Farrakhan and saying hateful things to co-founder Vanessa Wruble sure doesn’t look like intersectional feminism. If George W. Bush stood alongside a KKK official at a funeral, the media would ask the former president if he disavows the bigot. 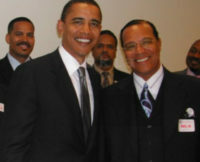 Not with Bill Clinton and Louis Farrakhan. If you thought Big Media would be interested in the story of public officials cozying up to a virulent bigot, you would be mistaken. Why won’t anyone ask Congressional Black Caucus members why they were hugging and meeting with the racist conspiracy theorist Louis Farrakhan? Democrats argue that Keith Ellison has apologized, so bringing up his past is a ‘smear.’ Even if he is a new man, it’s not a slur to put a politician’s career into context.